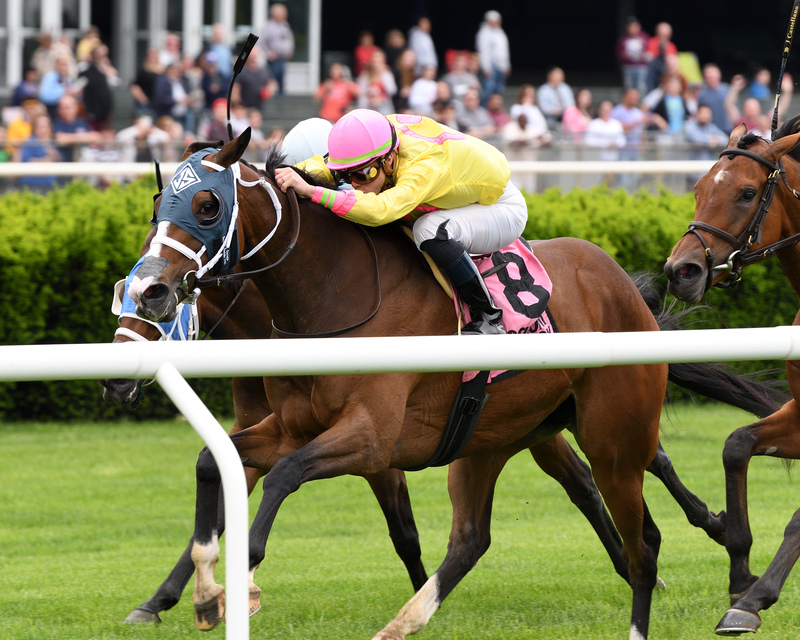 In a post-scratch field of seven with practically no speed signed on, an aggressive ride would appear the most likely route to victory in the $125,000 Mount Vernon Stakes that kicked off the stakes portion of Belmont’s Big Apple Showcase card on Memorial Day. Jockey Irad Ortiz, Jr. aboard 8-1 Feeling Bossy got the memo. Sharp out of the gate, Feeling Bossy led throughout and had enough left in the tank, not to mention the courage, to hold off the closers in the final furlong. A 5-year-old daughter of New York sire Courageous Cat (Questroyal Stud), Feeling Bossy came into the Mount Vernon off a seven-month layoff for Jason Servis, who trains the mare for owner Michael Dubb. Dubb claimed Feeling Bossy out of her penultimate start of 2017 for $62,500 from her breeder Emily Wygod and trainer James Jerkens. The Mount Vernon was the second start for her new connections and was a turnback from the longer distances she raced throughout 2017. Dubb explained that he claimed Feeling Bossy to fill a gap in his roster. 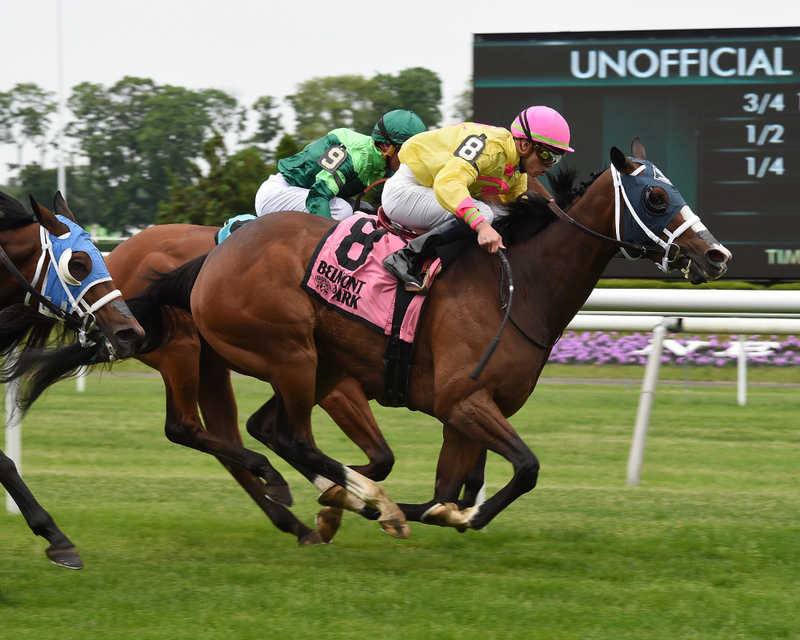 Sharp out of the gate to go one mile over the “good” Widener turf course, Feeling Bossy quickly opened up two lengths on Frosty Margarita, who was the putative lone speed on paper. Maintaining a daylight lead several paths off the rail through a first half in 48.77, Feeling Bossy stayed in charge and saved ground through the far turn. In the bend Jc’s Shooting Star advanced into second, while odds-on favorite Fifty Five endured traffic and a bump down near at the rail. In the home stretch Ortiz asked Feeling Bossy for her full effort. With a furlong to go, War Canoe loomed four-wide and Fifty Five overcame her troubles and threatened at the rail. Both were narrowing the margin to the leader. A winner of six of 15 races coming into the Mount Vernon, Feeling Bossy had tried stakes company four times before without a placing. Wins for Feeling Bossy have come in bunches. Breaking her maiden on April 21, 2016 at Aqueduct, she followed up the following month with a state-bred allowance score. Three consecutive allowance victories came in her last race at two, and her first starts at three against open company. From 16 starts, she has won six times and earned $351,790. Bred by Emily Wygod, Feeling Bossy is out of Keep the Feeling, a winning daughter of Kris S. who has produced four winners from six starters. After Feeling Bossy, her most successful offspring is a Benchmark gelding Field Report, who earned over $200,000. The mare last changed hands at public auction in 2010 when purchased at Barretts fall mixed sale by King River Ranch for $15,000. Feeling Bossy has a full sister Feeling Cathy and full brother, 3-year-old Feeling Courageous. Her most recent reported foal is a juvenile colt by Twirling Candy named Stupify.